“Everyone deserves a happy home.” – That’s what Homejoy cleaning services believe. For a long time, hiring home cleaning services has been considered an endeavor for the well-off because of the costly nature of the service. This, in most cases, has left out those that really need these services which are the middle class families; which have parents always putting in overtime hours at work since they can’t afford to put up with the hourly rates that companies ask for. However, with the rise of a San Francisco based home cleaning company called Homejoy, this is about to change. 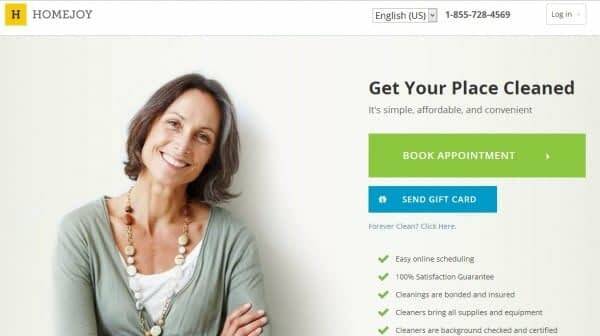 From a $20 fee per hour basic cleaning charge, this company makes what was being referred to as a luxury a basic need. They also offer a variety of other services together with their basic cleaning that include cleaning inside fridge, inside cabinets, inside oven, laundry wash, interior windows, interior walls all at unbeatable prices. Furthermore, this company also has a different way of doing things which is not only convenient for you but also easy and get this, you don’t even have to leave your home. To acquire their services, all a client has to do is create a profile on their online website and book an appointment. Once that is done, the company will reach into its extensive list of professionally certified cleaning experts and assign the most suitable person on that job. That is as simple as it is. You can even gift your loved ones a Homejoy Gift Card for the cleaning services. With its vast number of workers, clients as far as New York, Boston, Washington and many more cities can also enjoy their immaculate convenient and affordable services. Additionally, according to Homejoy reviews, the company has thus far accrued a huge deal of positive comments from clients that have been pleased with the services that the company has to offer. With that in mind, it is safe to say that the company is going steady with their goal of being the “Uber” in the field of home cleaning. Without a doubt, they have managed to revolutionize the cleaning industry and bring it closer to those that really need it, not only those who can afford it. Thank you for this review! If they are in our area I will definitely give them a try.